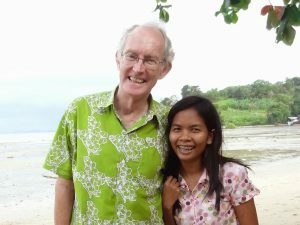 PHUKET: Alan Morison and Chutima Sidasathian of the news website Phuketwan.com have been tireless in their investigations of the treatment of Rohingya migrants, who — it is well documented — escape violence and hardship in Burma only to end up in virtual prison camps at the mercy of human traffickers in Southern Thailand. In a strange twist of fate, tomorrow (April 17), the Phuketwan reporting duo might end up as prisoners themselves. Alan & Chutima speaking at a local seminar, Phuket Town. 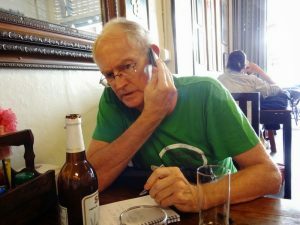 On the eve of Phuketwan’s court date in Phuket Town, where they’re set to defend themselves against criminal defamation and Computer Crimes charges, there’s been a flurry of news and commentary from around the world. If convicted, Alan and Chutima face jail time of up to 7 years and a fine of 100,000 baht (about $3,300 US). 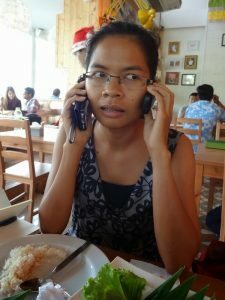 Chutima “Oi” taking/making calls over lunch. The charges stem from a paragraph taken from a Reuters investigation into Thai officials’ involvement in the Rohingya smuggling trade that Phuketwan published in an article in July 2013. 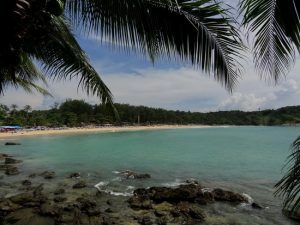 The story was one of several Reuters stories highlighting the plight of the Rohingya in Burma and Thailand. Busy reporter, but Alan always finds time for a Singha. By chance, earlier this week Reuters editors and reporters were popping celebratory Champagne following the announcement that these very same reports had earned the news agency a Pulitzer Prize. But so far Reuters has remained silent on the case of Phuketwan v the Navy. 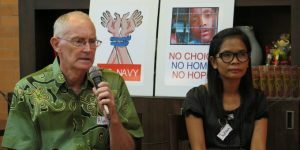 “This is a little bit about Thai Navy payback where Phuketwan has been a thorn in the side of the Navy for many years in the handling of the Rohingya and the Navy is determined to put them through the wringer,” [Human Rights Watch deputy Asia Director Phil] Robertson told AAP. “I have no doubt about it. I am sure the manner in which [Chutima] has helped open up the Rohingya story to the international organizations is one of the reasons for this prosecution. She has been the person who has, I guess, singularly opened up the Rohingya story to international media attention,” [Morison] said. “We won’t apply for bail, this is a bad law and it is an issue of the freedom of the press. This should not happen to the media in a democratic country,” [Chutima] said ahead of the hearing.